The CentreWest Region of the Congregation comprises the Australian States of South Australia and Western Australia, the Northern Territory and Timor Leste. The Sisters are located mainly around it edges from tiny Timor in the Timor Sea, to Darwin, Wyndham and Kununurra in the far north, down the west coast to Perth and then to Esperance in the far south, and from there across the Nullabor to the “settled areas” of South Australia. In this region there are wide variations in climate, from the tropical north, through the central deserts to the temperate south. Josephite Sisters have served in South Australia since the foundation of the Congregation at Penola in 1866. Their first official Mother House was in Adelaide but it moved to Sydney in 1888 and the Sisters formed the South Australian Province in 1895. While the education of children of the poor has always been their main focus, they also care for needy people in a variety of ways. 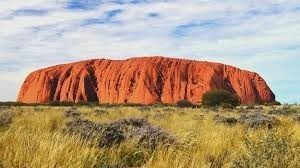 It is bounded by the Timor and Arafura Seas to the north, the Indian Ocean to the west and the Southern Ocean, and at its heart lies Uluru. In 1887, four Josephites made a foundation at Northampton in Western Australia. When the bishop decided to have them form a Diocesan Congregation, all but one Sister returned to Adelaide. Several likeminded women joined her and in 1897 the bishop had them move to the Eastern Goldfields of WA. In 1912, these Sisters amalgamated with the centralised Congregation and together they formed the Province of Western Australia. 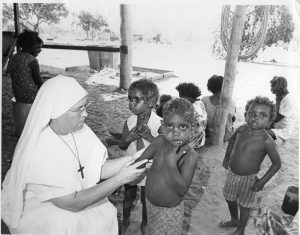 In 1964, the Congregation undertook a mission to the Aboriginal people of the Kimberley region and Sisters have ministered there ever since. Since 1989, several Sisters have ministered short term among the short term among the Aborigines of the Northern Territory. In 2012, they established a permanent base in Darwin. Tetun language, parent training, health literacy workshops, teacher training and a music for life program. Since early this century, one or more of these Sisters has lived there permanently. Wherever they are in this Region, the Sisters endeavour to show the compassionate heart and face of God to all whom they encounter in their everyday lives. They minister in a variety of ways, including education, aged care, family and disability support, spirituality, pastoral care and coordination, chaplaincy, parish pastoral leadership, ecology, counselling, prayer and hospitality.